Flesh that is zoned with shades of blue and other colors. However, the blue shades in the cap frequently fade to dingy tan, and the "orange" is often relegated to a dingy orangish coating on the lower or underground portion of the stem. Hydnellum alachuanum and Hydnellum cyaneotinctum are synonyms--for the time being, anyway; they represent eastern North American, hardwood-associated species that are similar in morphology but may well be brought back to life once DNA analysis discovers, as it is likely to, that there are a number of genetically distinct species in "Hydnellum caeruleum" that have evolved with widely different ecosystems. 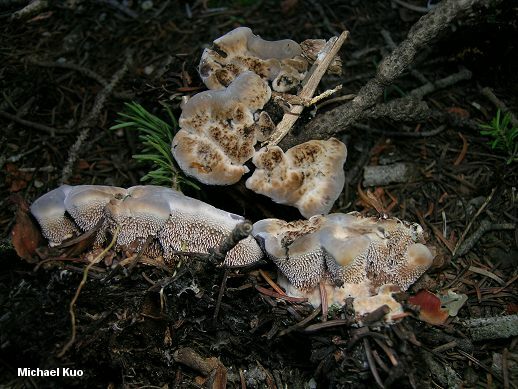 Hydnellum ferrugipes is a putatively distinct species that does not bruise blue. and which has blue zones in the flesh only after it has been dried for the herbarium. Ecology: Mycorrhizal with conifers in most areas but also with live oaks and other hardwoods in coastal California and on the Gulf Coast; growing alone or gregariously; summer and fall (or over winter in warm climates); widely distributed in North America. 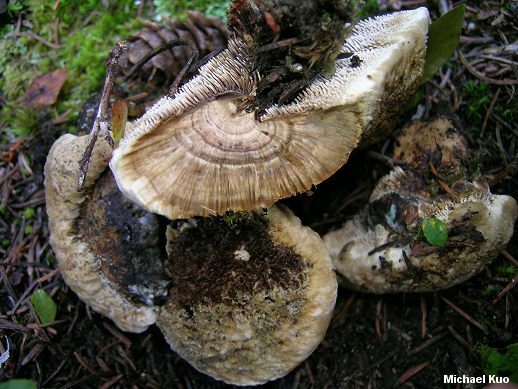 Cap: Usually single but occasionally fused with other caps; 3-15 cm wide; top-shaped to convex, becoming flat or shallowly depressed; somewhat velvety; sometimes ridged or pitted; when fresh and young white to whitish or very pale yellowish, but usually with a bluish cast, becoming dingy tan to brownish over the center or overall; the pale margin often bruising blue. 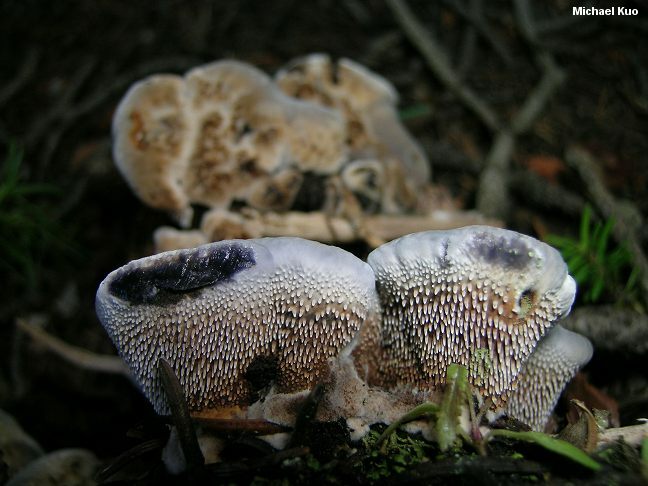 Undersurface: Running down the stem; covered with crowded spines that are 3-6 mm long; whitish to pale grayish at first, becoming brownish to brown. Stem: 2-5 cm long; 1-3 cm thick at apex; more or less cylindric, or with a slightly swollen base; orange to orangish. Flesh: Whitish to orangish or brownish, with zones of blue or brown; tough but pliant. Chemical Reactions: KOH on flesh olive green to blackish or purplish black. 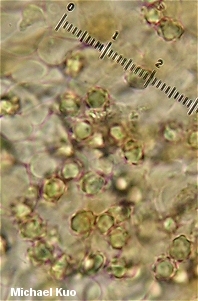 Microscopic Features: Spores 5-6.5 x 4.5-5.5 µ; subglobose to irregular; with low warts. Clamp connections absent. REFERENCES: (Horneman, 1825) Karsten, 1882. (Fries, 1821; Saccardo, 1888; Coker & Beers, 1951; Hall & Stuntz, 1972; Smith, Smith & Weber, 1981; Arora, 1986; Baird & Khan, 1986; Phillips, 1991/2005; Lincoff, 1992; Bessete, Miller, Bessette & Miller, 1995; Evenson, 1997; Barron, 1999; McNeil, 2006; Miller & Miller, 2006.) Herb. Kuo 09020602, 08110703, 09060802.